What's cuter than a kitten and a pumpkin? Nothing, in our humble opinion! Cats and pumpkins are some of the most common images used to celebrate Halloween. If you're looking for inspiration for your decorating, coloring pages for your children or just a fun activity that only takes a few minutes to complete, you've come to the right place. Our free printable coloring pages offer parents a wonderful variety of coloring sheets to give their children. They're easy to print and loads of fun to color. Print one for a quick activity at home, or print a bunch to keep your little one occupied during a road trip. We have coloring pages for all holidays and many different animals, characters and concepts. When you're a child, few things are as cathartic as grabbing a new box of sharp crayons and a coloring page or coloring book to put color down on a page. I loved it when I was a child, and I still love it now! It provides a creative outlet for children to express their emotions through the use of color. It also uses the brain in a different way than lectures and worksheets do, so look for coloring sheets based on topics that your child is currently learning in school. It's a great way to reinforce those important concepts. Halloween is just around the corner, though, so don't subject them to an "all work, no play" routine. Kids need time to just be kids, whether that's rolling around in the fall leaves or sipping on hot chocolate and coloring our free printable coloring sheets. 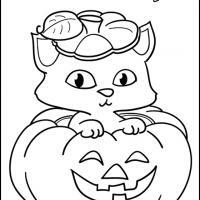 If you're looking for cats and pumpkins together, we've got two great coloring sheets for you or your children. Don't limit yourself to coloring them, though! They can be painted for a brighter, longer lasting effect. You can also use this as a template for creating your own Halloween treat bags, decorating bowls or framing and putting up in your home for a spooky celebration. This cat pumpkin carving sheet is adorable! It features a smiling kitten asleep on top of a jack-o-lantern. It's a sweet image that's perfect for younger children, as they typically don't like spookier images like ghosts, zombies, mummies and witches. Here's another adorable cat pumpkin image featuring a kitten popping up out of the jack-o-lantern. The top of the pumpkin is on the kitten's head. Again, this is a mild Halloween picture perfect for those little ones that want to enjoy the fun of the holiday without being spooked by it. To use these images in your Halloween decorations, try several different things. First, color and cut out the images you want to use. Tape the image to the front of small paper treat bags for your trick or treaters. If you'd like to use it in your décor outside, laminate the image first, then cut it. It can be used to accent Halloween wreaths or just to tape on the door as a cute way to welcome your guests.